I am so happy and thankful for my support network. I wasn't born into an emotionally supportive family who surrounds themselves with positive people who speak supportively to each other. My upbringing was luxurious but critical and emotionally destructive. It's taken years to get to the happy place I am at without self destructing. I have worked hard to cure my eating disorders and not hide them. Overcome the low self esteem I developed from my older brothers torment as a child and my moms constant criticisms. I am so thankful for the people who I have made my family who love me, believe in me and support me in the most positive light. By removing toxic people, toxic foods and toxic behaviors from my life, I found an inner and outer peace I never thought was possible. I can express my feelings in a healthy way, I process what people say for what it's worth and I work hard to make sure I am constantly moving forward towards my dreams. No matter how low you may feel, just take one step towards your dreams by removing one thing that's preventing you from getting there. Before you know it your issues are thousands of steps behind you and you will that much closer to your dreams. 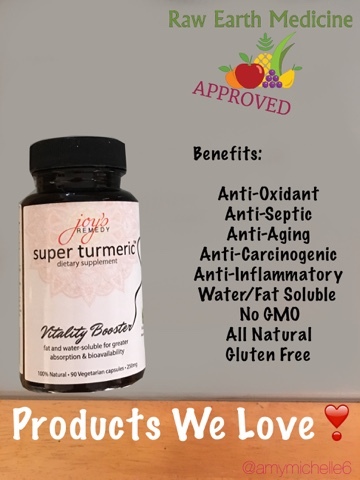 We love Joy's Remedy Super Turmeric which is vegetarian, all natural with no GMO's and is fat/water soluble for fast absobtion. The yellow/orange pigment of turmeric, which is called curcumin, is thought to be the primary pharmacological agent in turmeric. In numerous studies, curcumin's anti-inflammatory effects have been shown to be comparable to the potent drugs hydrocortisone and celebrex, as well as over-the-counter anti-inflammatory agents such as Advil or Ibuprofen. Unlike the drugs, which are associated with significant toxic effects such as ulcer formation, decreased white blood cell count and intestinal bleeding, curcumin produces no toxicity. Turmeric should be a staple in your nutrition for the prevention and the treatment of many common ailments and diseases. It can be used as a spice in cooking or can be taken as a supplement in pill form. We love Joy's Remedy because it's water and fat soluble which means the body will absorb it faster than eating Turmeric as a spice and won't need anything additional to activate it. Their team is made up of three brothers whose mother, Joy, gave them turmeric and other herbal remedies their whole lives for every ailment from colds and flus to cuts and bruises. The eldest brother became a businessman and the younger two went on to become doctors. Having seen the ins and outs of the healthcare industry and lack of natural options, the three set out to make their mother's remedies in convenient yet effective forms for the world to enjoy. After years of research and development, they would like to introduce you to Joy's Remedy Super Turmeric™, a highly bioavailable form of turmeric with a greater rate of absorption. Go to www.joysremedy.com for more information and to place an order! Joy's Remedy Super Turmeric is Raw Earth Medicine Approved! The first time I heard about Manuka Honey was when a radiologist suggested that lung cancer patients take a spoonful of Manuka Honey before radiation treatments to coat their throats and protect their esophagus from the harsh affects radiation has on the body. Manuka Honey is a product of New Zealand. It's the product of bees that pollinate the Manuka Bush. Due to its medicinal properties, Manuka Honey is graded by a medicinal standard called UMF, Unique Manuka Factor, a global standard in identifying and measuring the antibacterial strength of Manuka Honey. The UMF is used to assure that the Manuka Honey's medicinal properties are up to quality standards. After researching Manuka Honey verses other types of more mainstream honey, I was shocked to learn that Manuka honey has 4 times the nutritional content of any other flower honey. It also has a considerably higher level of enzymes than regular honey. These enzymes create a natural hydrogen peroxide that works as an antibacterial. Many strains of this honey have higher levels of hydrogen peroxide, methylglyoxal and dihydroxyacetone which are used to grade the UMF of the Manuka Honey. Some say that anything below +10 UMF doesn't carry any medicinal benefits while other claim it does. While using +5 UMF Manuka Honey, the benefits are noticeably present. While most honey on the shelves these days are high fructose corn syrup with a honey colored food dye, it's safe to say that with a UMF quality control, Manuka Honey is definitely something you should add to your diet. 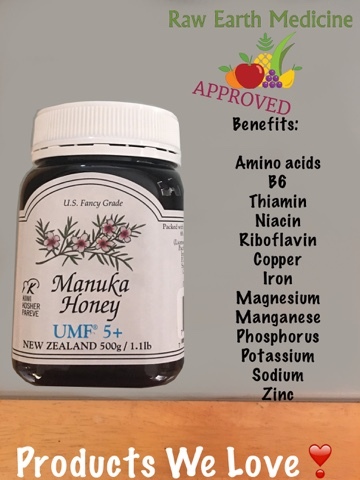 Manuka Honey which is rich in, Amino acid, B6, thiamin, niacin, riboflavin, pantothenic acid, Calcium, Copper, Iron, Magnesium, Manganese, Phosphorus, Potassium, Sodium and Zinc is Raw Earth Medicine Approved! Add all dry ingredients to the bottom of your cup. 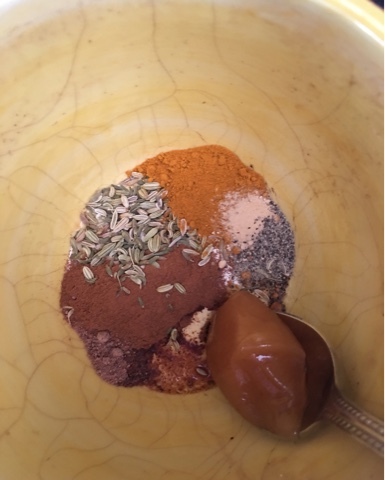 Put Manuka Honey on a spoon in the cup and pour the hot liquid over the spoon while while stiring the ingredients and Enjoy! The combination of Manuka Honey, Cinnamon and Turmeric work as a natural anti inflammatory, the equivalent to taking Advil or Celebrex. Having this latte every day will decrease the symptoms of chronic pain, arthritis, multiple sclerosis, chronic swelling, nerve damage and many other inflammation based diseases within 30 days of continual use. Adding the optional fennel seeds will help reduce the acid affect of coffee as well as reduce any symptoms from acid reflux, chronic heartburn and gastrointestinal issues. 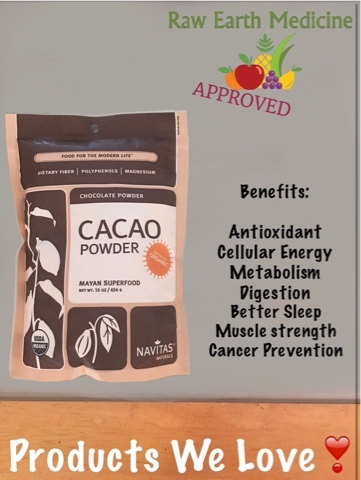 We love Navitas Naturals Cacao Powder! There are no GMO's, it's all natural with no chemical additives. There are a wide variety of recipes that you can use Navitas Naturals Cacao powder for like chocolate, cakes, cupcakes, brownies, hot cacao drinks and many other chocolate treats. By replacing Cocoa with Cacao powder you'll be using an unfiltered and more nutritious version of cocoa! Cacao is a super food that has dietary fiber, polyphenols and Magnesuim! Here's their benefits! Dietary fiber is great for the digestion, helping to maintain a healthy weight and lowering your risk of diabetes and heart disease. It's helps to maintain bowel health, lower cholesterol levels and helps to control blood sugar levels. Magnesium helps with cell energy production. Magnesium allows the body to produce more Insulin-like Growth Factor (IGF-1), which is a major contributor to the growth and strength of muscles. Magnesium metabolically aids in the breakdown and distribution of vitamins and nutrients when you eat! Magnesium will also help with sleep issues as Serotonin, which the body secretes for sleep is dependent on magnesium for its production. Polyphenols in Cacao help reduce cardiovascular and inflammatory diseases, metabolic disorders, and is used for cancer prevention. Their antioxidant properties may be responsible for many of their pharmacological effects, including the inhibition of lipid peroxidation and the protection of LDL-cholesterol against oxidation, and increase resistance to oxidative stress. The phenolics from cacao also modify the glycemic response and the lipid profile, decreasing platelet function and inflammation along with diastolic and systolic arterial pressures, which, taken together, may reduce the risk of cardiovascular mortality. Cocao polyphenols can also reduce and improve digestion. Cacao protects against diseases which oxidative stress is a contributor to, such as cancer. 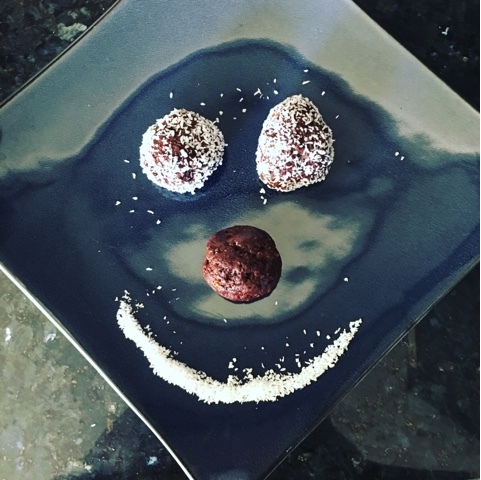 Try upgrading your baked goods and chocolate nutrition game by using Cacao powder! Put all ingredients in a food processor and pulse and grind until it forms a log.